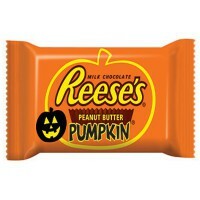 Your favorite chocolate and peanut butter cup didn't forget its Halloween costume this year! Perfect for the spookiest season, this limited edition chocolate treat will tickle your tastebuds and dress up your Halloween party, and is great as a gift for trick-or-treaters! Trust Reeses for the best of America's #1 sweet n' salty combination! Peanuts, milk chocolate (sugar, cocoa butter, chocolate, nonfat milk, milk fat, lactose [milk], emulsifiers E476-E322 [soy lecithin]), sugar, dextrose, chocolate, nonfat milk, 2% or less of: vegetable oils (cocoa butter, palm, shea, sunflower and/or safflower), salt, whey (milk), milk fat, soy lecithin E322, preservative E319, vanillin, artificial flavor. Contains GMO. Nutrition facts (for 100g): calories 500Kcal, total fat 29.4g (saturated fat 8.8g), total carbohydrate 52.9g (sugar 47.1g), protein 11.8g, salt 1g.